If you follow us on Facebook and/or Twitter you’ll probably have seen some baking over the last 12 months that hasn’t made it onto the blog. Sometimes we spend so much time baking that it’s hard to find the time to blog about our creations, especially since we also work…. January – I started off the year making a surprise 60th Birthday cake for Wendy. I wasn’t actually in the office that day so I got in super early to leave it on her desk and then got the train to Manchester. This meant I didn’t get to try the chocolate caramel ombre cake, so I have made it several times since then as well! February – It was my 30th Birthday in February and I had an Alice in Wonderland themed party, which included an afternoon tea. Becky made the cake but I made all the other bits including white chocolate and gingerbread macarons, lemon fondant fancies and heart jammy dodgers. 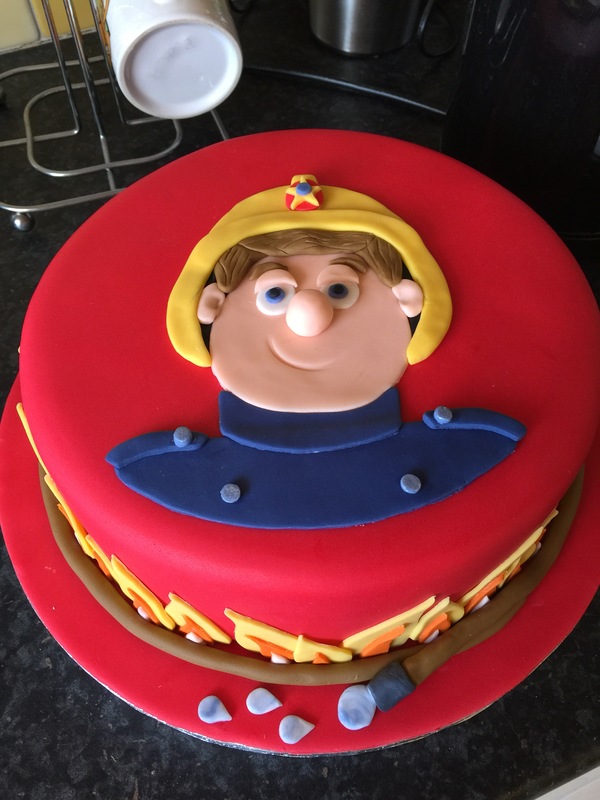 March – I made this super cool Fireman Sam cake, with some matching flame cupcakes for somebody that Tom worked with. Unfortunately I somehow to forgot to take any photos, other than this one, so I was unable to put it on the blog! I decorated the edges with flames, and wrapped a fireman’s hose round the bottom. April – Becky made this amazing Rabbit cake for Easter. She used a lovely lemon and pistachio cake recipe from Waitrose that can be found here. The rabbits ears were made from flower sugar paste with a big wire in and were left to go completely hard before being inserted. May – Most of Becky’s wedding cakes have been for friends from her running club and this was no exception. This beautiful forget me not covered cake was made for her friend Lisa. This gorgeous photograph is thanks to the photographer David who’s website can be found here. June – Sometimes the simple cakes are the most effective. This whole wedding cake was ivory with some piping on each tier making it stunning. July – I got to some safari themed first birthday cupcakes for our friend’s daughter Abi in July. The same weekend it was also her Christening so I re-decorated the top tier of Martin and Jen’s wedding cake. I even managed to use some of the original roses from their cake. August – Becky was asked by a colleague of her husbands to make this cool Scooby Do cake for her son’s 3rd Birthday. The cake needed to be dairy free, so it gave Becky the oppotunity to try out some new recipes. The hardest thing about it was the butter cream – it was made with non-dairy spread and it didn’t set in the fridge like normal butter cream, so icing with the sugar paste was much more challenging. September – I made some mole cupcakes for the cake trolley in the office one week. They were really quick to make – chocolate cupcakes decorated with crushed Oreos for the soil and moles made out of icing. The moles were so easy that even Tom managed to make one! October – I made this Halloween cake for a charity raffle in the office. I was able to make most of the decorations in advance and then just assemble it after I’d baked the cake. The rocks around the bottom were a great way to use up odd coloured/crumbling icing! November – These super cool pig cupcakes were probably some of the easiest to make and the decorations were minimal, but they are a lot of fun! The tails were made with flower sugar paste, to ensure that they were completely hard and stood upright. December – Better late than never, with the arrival of little Emily, it was a little tricker this year for Becky to ice her Christmas cake and it was done in stages over a couple of weeks, it eventually got finished just before new years eve! She experimented with her new airbrush equipment and she is still cleaning up the navy blue food colouring that seems to have dispersed all over her kitchen!